Mention Susun Weed's name in alternative healing circles and the conversation often takes on a tone of reverence -- which is somewhat ironic, given that the 57-year-old folk herbalist takes a certain pleasure in skewering some of natural medicine's most popular "cure-alls." Take soy, for instance. Once the domain of die-hard vegetarians, soy is making its way into mainstream American cuisine after a series of medical studies demonstrated the beneficial effects of soy compounds on heart health and menopause. It's all a big mistake, says Weed, author of "New Menopausal Years the Wise Woman Way," "Breast Cancer? Breast Health! the Wise Woman Way" plus two other books on women's health and natural healing. "Most women who stop eating large amounts of tofu find a very improved state of health," Weed said last week after dinner at her home in Woodstock, N.Y. She will be in Madison this weekend to lecture on menopause and herbal healing. Weed cites research by food scientist Mary Enig and epidemiology studies that differentiate between the fermented soy products traditional in Japan and the unfermented soy products popular in the United States. "In Japan, where admittedly breast cancer is low, the primary use of soy is fermented soy -- miso and tamari," says Weed. "Fermented soy is responsible for 90 percent of the soy eaten in the Japanese diet. Any Japanese person who ate tofu more than once a week doubled the risk of Alzheimer's." There are no sacred cows in Weed's approach to wellness and no hard-and-fast rules. She calls her approach the Wise Woman Way, a spiritual healing path that draws strongly on oral tradition and folklore. "I am not telling women how to do it right -- because there is no one right way -- I am sharing all the ways there are to do it, so they can choose, so they have their own power," she writes on her Web site. Weed's live-and-let-live approach translates into book sales well over the half-million mark and has garnered praise from a number of well-known physicians, including Christiane Northrup and Susan Love. 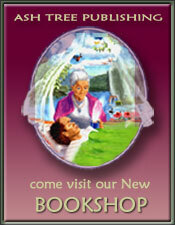 Learn more about the Wise Woman Herbal Series at Ash Tree Publishing online. Not bad for a woman without a college degree. Weed studied mathematics and artificial intelligence at UCLA for two years but dropped out "to pursue life," she says. 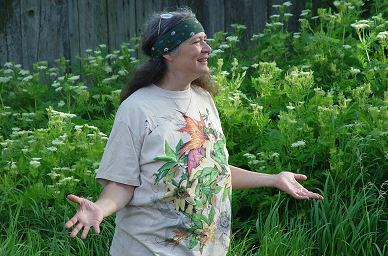 For the past 35 years she has studied herbs through apprenticeships, exhaustive reading, and experimentation. The absence of credentials concerns her critics, who call her approach "misguided" and "dangerous thinking." Especially controversial are her thoughts on mammograms (more harm than good) and progesterone creams (ditto), but her doubts about these approaches are echoed in some mainstream medical literature. "I love science. I read a lot of scientific things. It's kind of a free-for-all, people arguing back and forth," Weed says. "It's not infallible, (but) it's self-correcting." The Wise Woman philosophy emphasizes nourishment, intuition and accepting change. "It accepts everything from shamanic trances and placebos to surgery and chemotherapy," Weed says. "In the Wise Woman tradition, all options are open to me." But don't get her started on that awful-tasting flax oil women are told to swallow by the spoonful to ward off breast cancer. The reason it tastes so awful is because it's rancid, Weed says. "The chemist friends that I've asked about flax oil tell me it's like cancer in a can because of the rancidity factor." She suggests buying whole flax seeds instead, and grinding them in a coffee or spice grinder. "When ground and cooked in baked goods like bread and muffins, flax seed is a wonderful addition to the diet." Note that she says "cooked." She's not fond of the raw foods craze sweeping health-obsessed sectors of the nation. She sees it as the newest in a long line of "natural" approaches that punish the body and taste buds in pursuit of unnatural perfection. "When someone comes along and says this is a way to be clean and be pure, we're suckers for it," Weed says. The Wise Woman tradition "is when we stop cleansing and purifying, when we start accepting ourselves and others for the incredible, magical gift of sacredness that we are."